In commodities, the time to get bullish is usually when prices are pressuring the industry and sentiment is persistently and deeply negative. The time to get bearish is usually when prices are skyrocketing, industry participants are celebrating wondrous fortunes, and sentiment is as euphoric as can be. Since I am long-term bullish on cocoa, I am prone to identify the buying opportunities and find reasons to hold through the bearish moments. 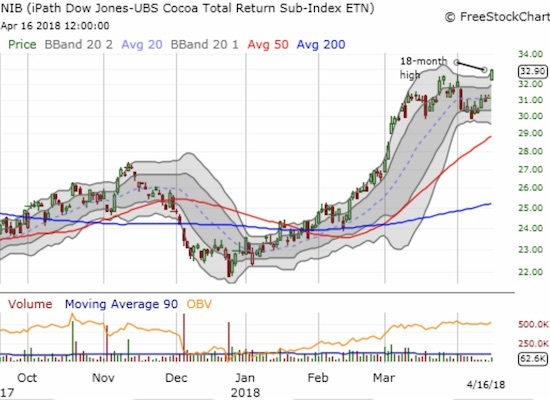 Just last week, I gave my reasons for getting cautious enough to lock in profits on my holdings in iPath Bloomberg Cocoa SubTR ETN (NIB). Turns out cocoa still has some surprises: NIB broke out to a fresh 18-month high on the heels of a surge in the price of cocoa. The iPath Bloomberg Cocoa SubTR ETN (NIB) gained a whopping 5.4% on a very bullish breakout. This kind of strong price action is usually driven by some abrupt weather event and/or strong pronouncements from analysts. Cocoa received both. “Heavy rainfall could damage Ivory Coast’s April-September cocoa mid-crop, farmers said on Monday, as soil moisture content is high and trees are loaded with fragile flowers and cherelles. Since weather is by nature unpredictable, I tend not to extrapolate too much from these kinds of projections. I prefer to wait for the actual weather and the actual impact. Granted that strategy will make me lag a market that is buzzing from weather expectations, but I prefer that risk rather than hoping I am rolling my dice with the lucky. Cocoa: Has A Floor Been Formed? Will The Best Performing Commodity YTD Continue?